I'm Becky and this is my little slice of the net where I will be recording all my adventures in the garden, kitchen and world in general! Happy New Year and Welcome the 2017 Garden! It’s officially 2017! Another year gone and I really don’t know where it went! 2016 flew past me in whirl of exams, moving and weddings and although it wasn’t my most productive in the garden, it was definitely one of the best years. I know I’m a little late with a Hello 2017 post but January is the busiest month of the year at work so I’m pleased to be posting at all. January is on of my favourite times of the year in the garden process. It’s the time when you can sit with a cup of tea, garden journals and seed catalogues. You can put your dreams and ideas for the coming year down on paper in the first step to making them a reality. As this is the first full year of growing at our house I’m more excited than usual for this process. I have two 6ft x 3ft beds and one 3ft x 3ft bed to fill and I’m determined to fill them. If I’m honest it’s actually a little overwhelming. I keep changing my mind about what to grow, where and how much I’ll need. I’m desperate to get the best use out of my space and make us as self sufficient as possible. I’ve started putting together a list of the fruit and vegetables we regularly consume as the best starting point. From there I’ll take out items that take up to much space or require more work than I can give them this year (I have my final accountancy exams in July!). Depending on how that list looks like I might add a few new things to try for fun. As soon as my plans are finalised I’ll share it here on the blog. Another part of my planning process is to go through my packets of seeds. Your seeds are obviously a crucial part of the years planning and so I like to get a handle on what I have and what I need. Plus who doesn’t love an excuse to go seed shopping? 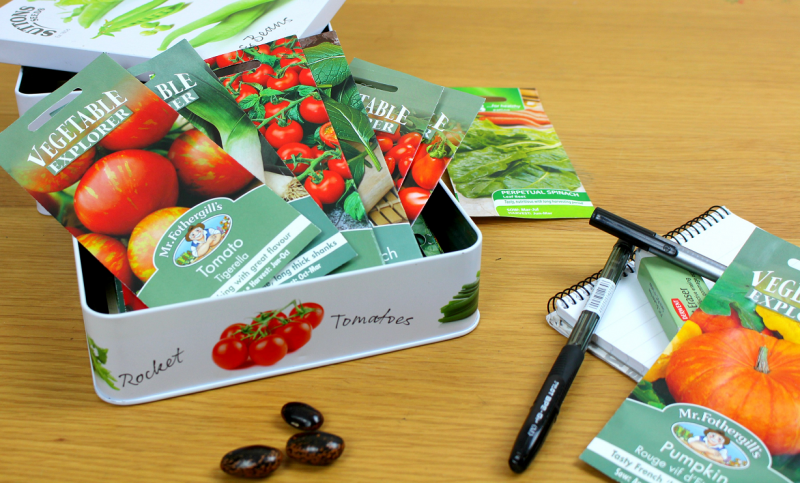 I’ll be attending the Hereford seed swap again this year with some excess seed packets in the hope of getting some interesting new things to try. If you have a seed swap event in your area I highly recommend going along! If I have any hope of having a successful garden this year I need to get my greenhouse relocated from my parents house. Unfortunately, freezing temperatures of January have not been the most motivating. I’ll need to at least partly take apart the structure to get it over two fences and transport to it’s new home. It was a nightmare to put up and I’m not looking forward to it to repeating that. Once January is out of the way though it’s going to have to be my main priority. I’ve also been dedicating a bit of time to planning the front garden. A small patch of our outside area by the front door was ‘landscaped’ when we moved in. I use the term landscaped loosely as they essentially just put a few blocks of different plants in. They’re now overrun by weeds and a complete eye sore. I have plans for some kind of wildlife/bee friendly flower garden but I’m worried it will look a bit messy for the front of the house. I have some big plans for the blog this year. I want to post a lot more regularly and improve the blogs image. I’ve already started by investing in a better WordPress theme and I’m really happy with the results. What do you think? Hopefully as the year goes on you’ll be able to notice the differences starting to appear. I’d really love to hear about your plans this year so feel free to comment or email me. Happy Growing! As it’s the last day of 2016 I’d like to spend it looking back on how I spent 2016 and what I grew. We moved house at the beginning of April so missed a lot of the sowing season. But we did manage to spend a lot of the summer planning and creating the garden so we could dive right in next year. 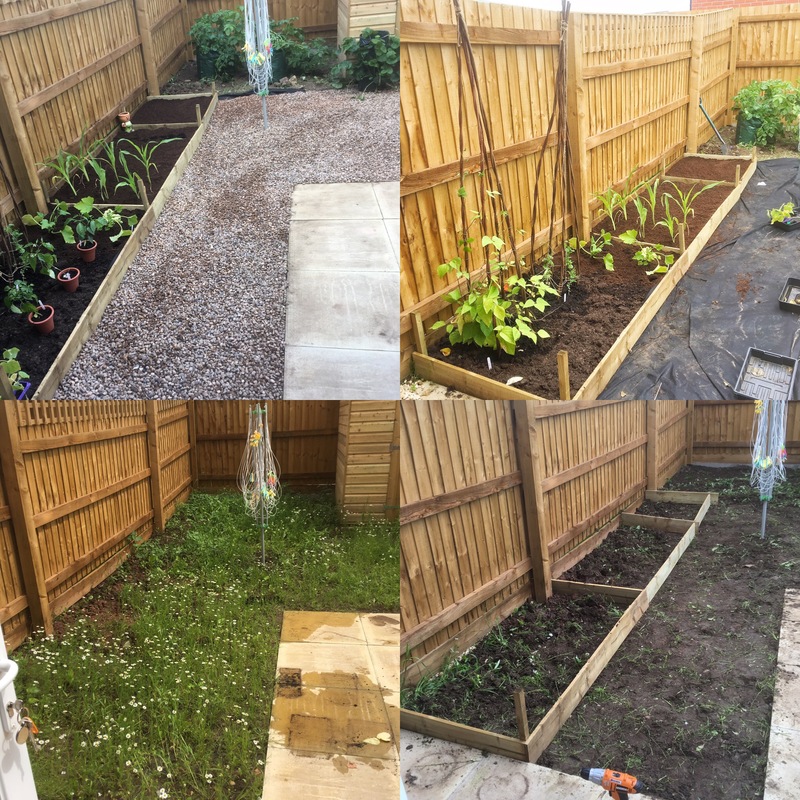 We now have two large raised beds and one smaller bed along the fence. We have room at the back of the garden for the greenhouse (which needs moving over from my parents house), a small shed and plenty of patio and fence space for pots. 2017 will be our first full year of growing at the new house and I am so excited. Runner beans – I love runner beans. Both to eat and grow. I’ve grown them every year since I started growing my own veggies and they’ve never let me down. They are easy to look after and always provided a large crop. Courgettes – My first attempt at courgette was relatively successful. We had large healthy plants and plenty of courgettes per plant. Unfortunately, I wasn’t on top of picking them and a few got very large. We ate them all the same and got a fair few meals out of them. We had two plants this year but for the amount we eat and the room they take up I’ll only be looking to plant one this year. Sweetcorn – This was going SO well and then…. nothing. I don’t know what happened but the plants didn’t produce any cobs. Any ideas? I planted six plants in rows of three and I shook them to pollinate. I won’t be trying these again in 2017 anyway as the space taken up for the potential yield doesn’t fit my plan. 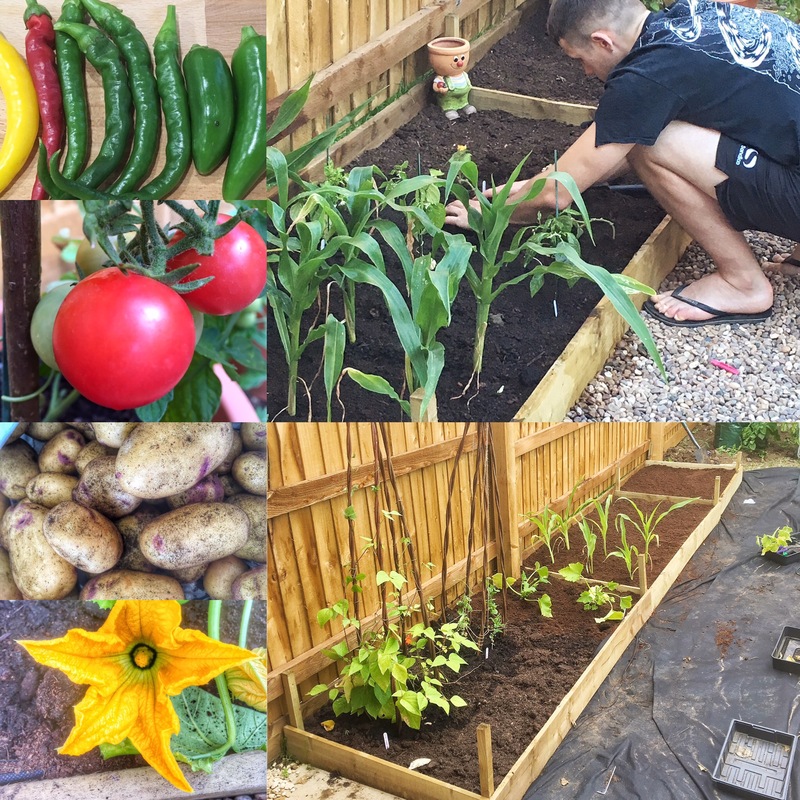 Chillies – We grew three types of chillies; Jalapeno, Cayenne and an unknown variety from the seed swap. There was one plant of each and they thrived. Each plant had tons of chillies. I want to try some new varieties in pots this year with the potential to attempt overwintering. Tomatoes – We grew four plants of two different varieties this year in pots. The crops were plentiful but took a long time to turn red. Mr T&F said they weren’t very nice to eat either. I’m putting this down to a lack of proper watering and care. I’m determined to do better in 2017. Potatoes – Mr T&F attempted some second early potatoes in bags this year. We got an okay amount of potatoes from the two bags but they didn’t last us very long. I’d like to plant a few more bags of different varieties next year. It was a modest attempt in 2016 but some interesting learning curves. I can’t wait to get stuck into 2017 and have a productive garden. I have so many plans and ideas and can’t wait to get stuck in. 2017 is going to be a healthy and productive year and I want our kitchen garden to be a big part of that. I’ll be starting my 2017 plans over the next couple of weeks and once they’re finalised I’ll be sharing them here on the blog. What were your 2016 successes and failures? We’ve been working really hard on our little plot of land over the last couple of weeks and I have to say I’m really pleased with how it’s looking. After our holiday in June we came back to the bottom left picture. We started by chopping the grass and weeds down and turning the soil over (or what little soil there was). We quickly came to realise that new build properties come with a garden that is full of rubbish, poor soil and concrete. This meant the best way forward was raised beds. We actually brought some raised bed kits from B&Q, these ones to be precise. In this instance you pretty much get what you pay for. The woods not the best quality, some is slightly bent but it’s all cut to length and ready to assemble which is what we wanted. We did buy one of the square versions to go on the end as well. I’m really pleased with how they look to be honest! However, next year I think we will be adding another layer to the beds in order to maximise the soil available to our plants. We put some black fabric down in the rest of the garden and filled with gravel. There didn’t seem much point having grass in such a small area, we’d only have to buy a mower. We’re definitely a little over friendly with the staff in our local B&Q after this house move! We purchased a little four seated patio set and a BBQ. I think all we have left now is to bring my greenhouse over from my parents. I really have no idea how I’m going to manage this yet without completely taking it down, to be honest I’ve been putting it off. It’s a polycarbonate greenhouse so at least I don’t have to worry about glass breaking. But I don’t have the instructions any more and it was a real pain to put up! Any ideas? 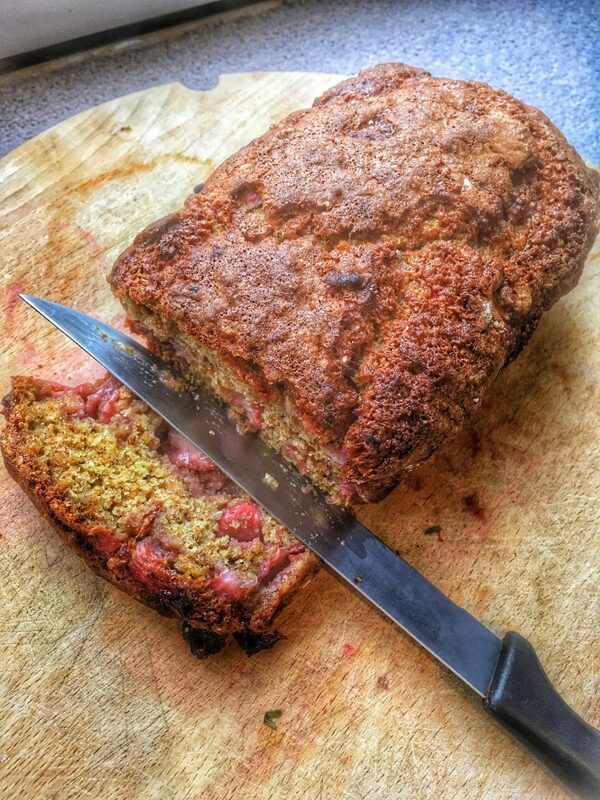 This week I’m sharing a delicious strawberry banana bread recipe with you. I was hoping to be able to share my favourite strawberry muffin recipe to follow on from last weeks 5 health benefits of Strawberries post but, it seems I’ve left my muffin tins at my parents during our move. This actually worked out as I had some bananas that needed using up and so you get the details of this tasty bread! I’m really loving all the fresh strawberries at the moment. I also love banana bread, it’s quick to make and yummy. Combine the two and you have this amazing treat. I must warn you this isn’t the healthiest recipe in the world but its so good it might not matter just this once? It contains fruit, that counts right? Preheat the oven to 180c. Line your loaf pan with grease proof paper. In a large bowl, cream together the butter and sugar with a wooden spoon. Beat the two eggs then add to the sugar and butter mixture. Beat until combined. Mix together flour, baking soda and salt. Add to the wet mix slowly and mix until just combined. Be careful not to over mix. Pour batter into your prepared pan and bake at 180c for 45 – 60mins until a toothpick inserted in the middle comes out clean. I really hope you enjoy this strawberry banana bread recipe. Please let me know if you give it a try and what you thought of it! Also let me know what strawberry recipes you enjoy. I had my first harvest of strawberries for the year this weekend and it got me thinking what are the health benefits of strawberries? Nothing beats the taste of fresh strawberries but how do they really benefit our bodies? 1. Good source of Vitamin C – Vitamin C helps to promote healthy eyes, helps fight cancer and helps with the production of collagen (for younger looking skin). 2. Contain a good amount of fibre – Fibre is a necessity for healthy digestion. 3. Antioxidants and phytochemicals found in strawberries can help to reduce inflammation of joints – Reducing the risk of diseases such as arthritis. 4. Rich in potassium and magnesium content – both of which are effective in lowering high blood pressure. 5. High fibre content, folate, no fats, and high levels of antioxidants such as vitamin-C are effective at reducing cholesterol in the arteries and vessels. As you can see, not only are they delicious but they really are good for you! I ate my small harvest of berries with some pancakes, blueberries and honey for a yummy and nutritious Sunday breakfast. Next week I’m hoping to have my favourite strawberry muffin recipe ready to share! 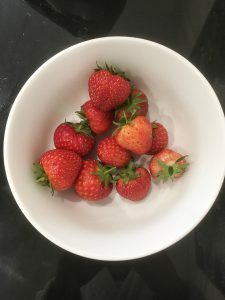 If you’re interested in growing your own strawberries check out my 5 tips for growing strawberries.